There is a rooster that lives next door, although for what, I’m really not sure. He has no hens, he has no chicks, he has no one to call up quick. So every day he moseys over, acting like he’s sniffing clover. Some conversation, a crowing match! But, no one cares, they ignore him so! But he’s a stranger and strangers aren’t welcome! So around our yard, he wanders alone, up until time he is called home. Back to his perch in the neighbor’s yard. Flirting can be a lot of work. Thru itsy-bitsy chicken wire, he chirps and struts but makes no impression. Someone with whom to share his scratch, some clucking, some hatching then a family to match! He really is a lovely creature. The neighbors bought him for me when their dogs killed several of my hens. 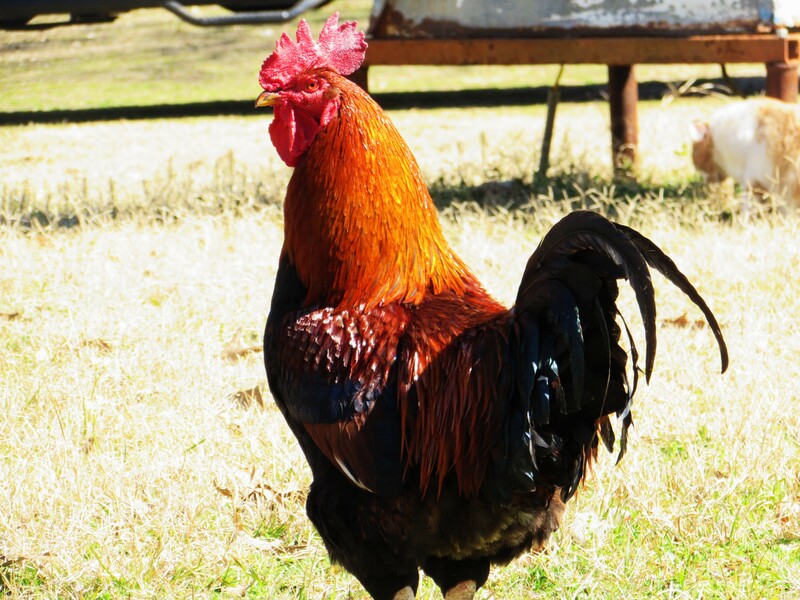 However, my old rooster, Randy and this one did not get along AT ALL. It was a bloody, horrid mess. Now, he lives next door but comes over every day, trying to be a part of the flock. Poor thing. I feel your pain old boy! I finally found a young chick that felt sorry for me! Now we are happy after hatching two young ones who now have their own! A handsome rooster like you just can’t give up! He is a handsome one! He sure is handsome ..